Hog Roast Lizard may be brilliant, professional hog roast caterers but our talents do not end there. As part of our team we also run a factory in the north west of England where we design and manufacture all of our machines that you will see us using at our events. 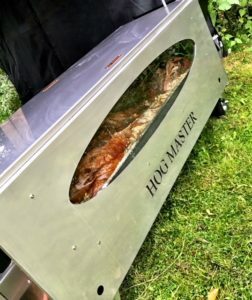 These machines are not even just for our own Hog Roast Lizard exclusive use! We hire and sell them to the public and catering companies around the UK so that everyone can try hog roast catering for themselves and experience the pure satisfaction after catering a delicious meal for your guests. 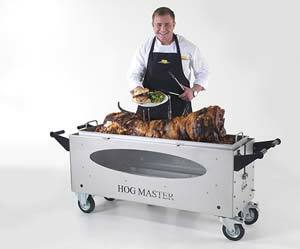 We have a wide range of machines available for both hire and sale but our most popular by far is the Hogmaster. This classic machine was one of the first we designed and has truly stood the test of time. It is both versatile and lightweight making it ideal for catering on the move and is also durable, so you know it won’t let you down and will provide nothing but perfect results every time! This week Hog Roast Lizard had an enquiry from Adam. Adam was a local butcher and decided he ought to have a go at cooking some of the meat he sells to the public. He mentioned that he was actually a beginner to the kitchen and didn’t know the first place to start. We reassured him that he had done the right thing by contacting us as our machines really do all the hard work for you! 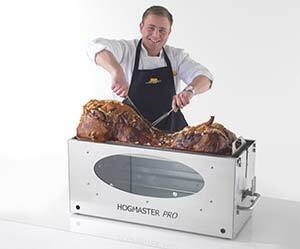 This sounded good to Adam and he booked in to hire one of our Hogmaster machines at the weekend. As per our policy we invited him to our factory to give him a quick crash course in the art of hog roasting to make sure he could really get the most out of his event and enjoy it. Adam was surprised at how quickly he picked it up and was looking forward to creating the perfect meal for his friends and family! Visits To Our Factory and Showroom.